My Thanksgiving in Boston adventure continues! Or, my American history lesson, rather. 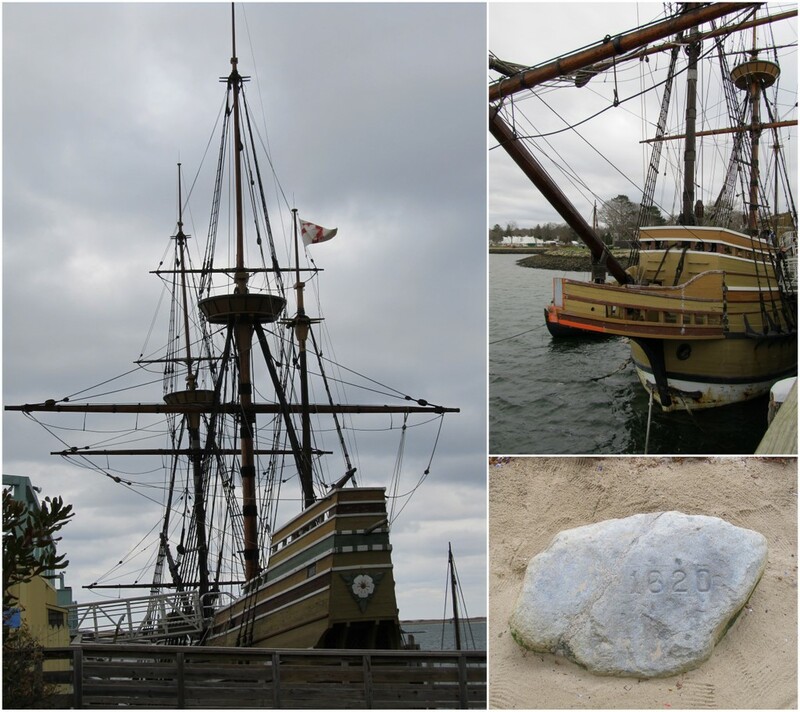 I'd actually never been to see the Mayflower or Plimoth Plantation, but it was a timely and enriching way to spend Thanksgiving week. (And it's something Bob's been bugging me to do with him everytime we've visited Boston - even though he's been there countless times... The irony is infinite.) All myths/legends/truths of the holiday aside, I think the curators of Mayflower II (a replica of the original that was built in England and made the same trip of the original in 1957) and of Plimoth Plantation (including the Wampanoag Homesite and 17th-Century English Village) have done a wonderful job of presenting all sides to the story in an ultimately rewarding way. I'll not go into that any more here, but do check it out. It was a cold, blustery day, made even more so by the coastal weather. Thank heavens for my (new) big cozy infinity scarf and multiple layers! Since I've really come to love the majesty of ships (you'll see more in tomorrow's post), I braved the elements long enough to see as much as possible inside and out, and even get a few great pictures. I wasn't about to take off the trench, so this is closest I was able to get to an outfit shot at the harbor. This was also about the 7th of 10 attempts to get a picture of me without hair blowing all over my face. There's no feigning the cold, though! And atop the hill in the meeting house overlooking the village and coast, where the sun finally came out for us. And so I shed my trench for a little outfit shot. Not my best ensemble ever worn - had I not planned to wear the trench all day, I might have worn a belt or a different under-layer - but the layers, flat boots (and thus skinnies) were totally necessary for the day. And just nautical enough. This looks like an interesting tour, I love history :) Very pretty trench! Oh my goodness, I grew up in Vermont and took many trips to Plimoth Plantation as a kid. I loved it! Looking at your pictures brings back all those great memories! Your outfit is so cute! I love the scarf. Jessica, it seems like the prefect Thanksgiving vacation! I love your classic and confident style. thanks so much! it really was a great way to spend the week! thanks! i'm such a sucker for an infinity scarf. aw, that's fantastic! it really was a great experience. wish i was a grade schooler that got to go there as a kid! the whole trip definitely made me appreciate american history more, that's for sure. i got the trench for a steal, too! i walked into a Banana Republic last year and they were having a 40% off everything sale, and this trench was even marked down! i'd been wanting one forever, and this was just the perfect score in every way. Great trench! Is there anything more classic?